Existing users upgrading to Serendipity Blackmagic / Megarip / Veripress 6.0 will notice changes to Pagesetups in the Workbench database and the addition of a new Data Type – Jobticket. Jobtickets consist of the configurable options, formerly part of Pagesetup, used to manipulate incoming jobs for the desired output. Users with multiple Pagesetups formerly using the same input, colour, effects and other options are now able to use a single Jobticket when Submitting jobs. If a modification is required, it only needs to be changed in the Jobticket, not in all Pagesetups. A Jobticket can be linked to a specific Pagesetup, changed or created on-the-fly via the updated Submit window. How is the database altered when upgrading to version 6.0? All existing Pagesetups are split into two database items, a Pagesetup and a Jobticket with the same name. Pagesetups retain the Output panel – now the Output Options tab, and the Publish panel – now the Publish & Flow Control tab. Jobtickets contain all other options from their former Pagesetup, reorganised into a new tab layout. They also now contain the Anti-aliasing and 16-bit processing options from the Pagesetup Output panel. Each Jobticket is assigned as the default Jobticket for its former Pagesetup – a new setting in the Output Options tab. In the case where multiple pre-update Pagesetups had identical settings, new Jobtickets are not created for each Pagesetup. Rather, a single Jobticket is created from the first Pagesetup in the Item list, then assigned as the default to all the Pagesetups. It is assumed that over time, users will delete extraneous or duplicate Jobtickets, making their workflows leaner, more efficient and easily adapted. 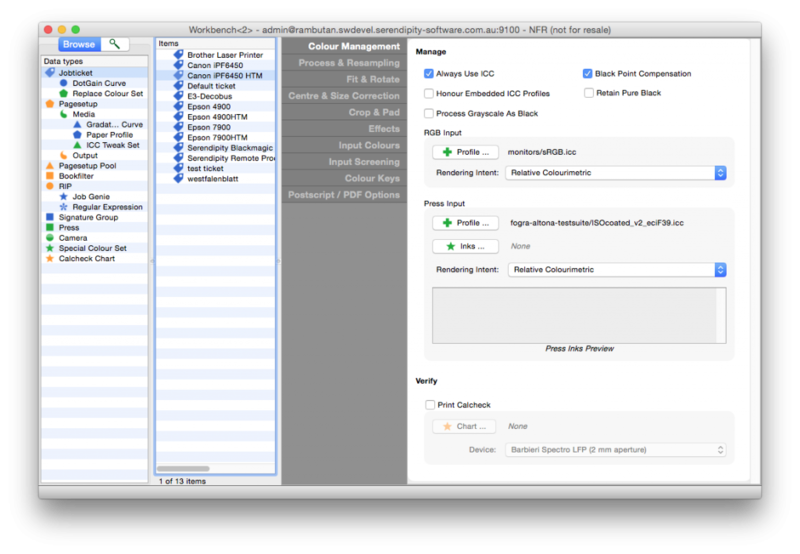 NOTE – after upgrading, jobs submitted to a Pagesetup will output exactly as they did in the previous software version. Process Grayscale as Black – when enabled, this option converts and processes grayscale PSD, JPEG, BMG, TIFF and PNG files submitted to the Jobticket as Process Black (K). This in turn, causes them to use a CMYK based CMS workflow as opposed to an RGB/Grey one. Press Inks Preview – When a colour set is chosen via the Inks button, a preview of the colour swatches will appear. Special Colour Set – assign a special colour set specifically for use by jobs submitted via the Jobticket. Select a Special Colour Set from the list of available sets, preview the set, edit, or create a new one. NOTE: These specials are matched prior to the system default special colour set. If a Special Colour Set is assigned in the Jobticket, it will override the default system specials. See the Jobticket knowledge base article for more information on how to use them in your workflow. This entry was posted in Blackmagic, Megarip, Serendipity Client, Veripress, Workbench and tagged Version 6.0+. Bookmark the permalink.